This young lady is like a bright shining light in every class she has and her smile is well known throughout the studio. As dedicated as she is talented, she gives everything she has to every class she takes. Her energy and sense of fun is infectious! She is an absolute pleasure to teach and pushes herself in everything she does. She is a great friend and role model to all students. She is a caring and supportive member of the studio and is always willing to lend a hand. She is a deserving and hardworking dancer who doesn’t know the meaning of less than 100%. 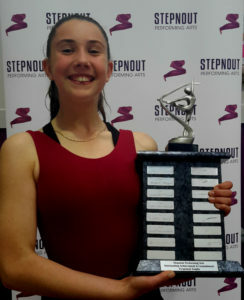 This years Outstanding Achievement Award proudly goes to Sarah Quarantotto! Congratulations Sarah!